Campsite chalets (6) sleep two in each. There are no cooking or en-suite facilities in these rooms. You would make use of the central ablution facility. Each unit has its own braai area and there is parking adjacent to each room. Complimentary tea & coffee. Deck room (1) sleeps two in beautiful teak framed beds. Also making use of the central ablution facility. Its secluded position nestled at the bottom of the campsite makes for complete privacy whilst overlooking the river. 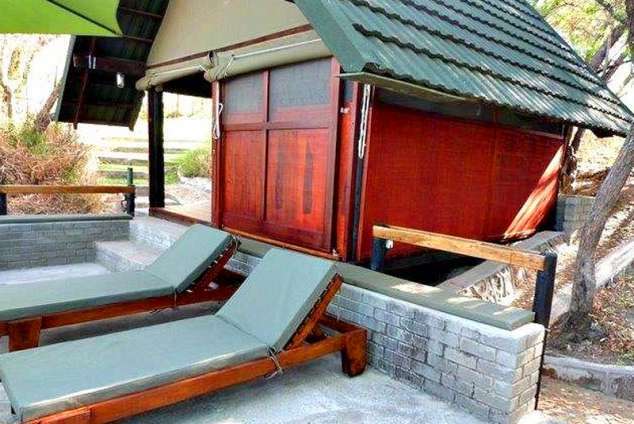 A private braai area is in front of the unit and parking is adjacent to the room. Complimentary tea & coffee. Lawned campsites attract many compliments as does our beautifully clean & spacious ablution facility. Woodlands Lodge is more than a Stop Over & we encourage you to stay a few days to really appreciate the ambiance of peace & tranquillity and watch the abundant bird life for which we are also well known. 1534 page views since 19 Feb, 2015.